Is clár gníomhaíochtaí é Spraoi Spórt. Cuireann sé súgradh agus gluaiseacht fhisiceach chun cinn. Tá an clár bunaithe ar spraoi, agus tá amhráin agus cluichí corpraithe mar chuid den phacáiste ina bhfuil leabhar agus DVD. 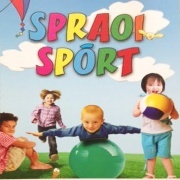 Spraoi Spórt is an activity programme. It promotes physical play and movement. The programme is based on fun, and songs and games are part of the package which includes a book and a DVD.